When the U.S. Food and Drug Administration finally approved Dendreon's (DNDN) breakthrough prostate cancer vaccine Provenge in late April, the company said it would be able to supply the medicine for only 2,000 patients for the next 12 months. It's perhaps not surprising, then, to hear that prostate cancer patients face rationing of the treatment and delays of a year or more. As it stands now, hospital waiting lists for the drug are far greater than the company's capacity to produce it, Bloomberg reports. Provenge is a treatment for men with advanced prostate cancer. It is produced from a patient's own white blood cells. The cells are exposed to a protein that's found in most prostate cancers. The protein has been linked to an immune-stimulating substance. The goal is to train the patient's own immune system to attack the cancer. The blood is then administered intravenously back to the patient in a three-dose schedule given at about two-week intervals. But Dendreon can only produce enough Provenge to treat about 2% of eligible patients until manufacturing increases in mid-2011, COO Hans Bishop told Bloomberg. This means, hospitals are scrambling to decide who should get the drug, with some considering principles used for high-demand organ transplants. Dendreon is producing the initial doses in a single New Jersey plant. 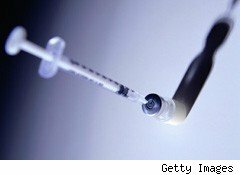 The facility will reach full capacity in early 2011, quadrupling the available vaccine, Bishop told Bloomberg. By the end of next year, the New Jersey plant, as well as facilities in Atlanta and Los Angeles, should produce medicine each year valued at between $1.25 billion and $2.5 billion, he said, which was no different than the company's previous estimates. The cost of a full-course of treatment is $93,000 ($31,000 per infusion), making Provenge one of the more expensive drugs on the market. Investors are also concerned about shortfalls, sending Dendreon shares down over 30% since they peaked after Provenge was approved on April 29. However, shares of Dendreon are paring losses, up over 3% in midday trading Monday.